The Palms Casino Resort in Las Vegas had set itself out to be the party place in Las Vegas when most resort owners were overly concerned with themes. It has always been that way, even back in 2002 when developer George Maloof Jr. opened the property. "If anything, Las Vegas is a party place and it will always be a party place. We (The Palms) will strive to be party central," Maloof told me a few days before he opened the property. Making good on his promise, Maloof set out to build a trendsetting property. And by most measures, he did. If any property sparked the party-club atmosphere that Las Vegas has become, it's easy enough to make the case that it was The Palms. The Palms' Kool-Aid Is Klout. By becoming celebrity central, it only makes sense that The Palms would eventually embrace social media. It made a move rather late in the trendsetting scheme (Vegas lags behind in social media with programs run by people fresh out of three-day workshops) and the program is largely broadcast oriented. However, they are doing a fine job, overall, in a meandering sort of way. At least I thought so, until I read just how much Kool-Aid the property had drunk with Klout. David Teicher wrote an interesting article about The Palms for AdAge. The chief marketing officer, Jason Gastwirth, is building a "Klout Klub." Specifically, people with higher Klout scores will receive access to more amenities than people who do not. Unfortunately, what Gastwirth doesn't know is that Klout, as interesting and fun and silly as it can be, doesn't measure influence. It only pretends it does much in the same way star-bellied sneetches believed they were better than sneetches without stars. Right. Like all Twitter "influence" algorithms, it tracks RTs and mentions as some sort of indicator of influence. They are not. In fact, Klout is largely static and makes more mistakes than most. For example, unless you manually update the score and are extremely active on Twitter, your score will stay the same as the time you first stumbled upon it. And, for someone like me, as an example, I have an ultra low influence score because I only use Twitter to keep up with and have conversations with about 2,900 people in the field (generally people with very high Klout scores). I could change that, if I wanted to. Gaming Klout is relatively simple. If you participate in chat sessions or run one, your "influence" measure will skyrocket because Twitter chat sessions are indicative of generating heavy RTs and mentions. (You can also create a dummy account and have them chat you up, if you want to.) And, of course, you can gin it all up with auto follows and searches for people who automatically follow back. That's just for starters. However, even more daunting than that is what Klout doesn't consider. It doesn't consider the 3,500 subscribers here. It doesn't consider a multitude of other social networks. It doesn't consider thousands of people who recently discovered one of our side projects. And it doesn't consider any of the other social media programs we help manage. It really doesn't measure anything. In fact, it is equally interesting that Klout scores a fledgling Twitter account for our side project (usually manned by volunteer Justin) with 28, 20 points higher than mine, despite having only 120+ connections. That is fine with me, especially because it claims I have "influence" over one person whom I haven't chatted with in six months and another person in more than one year. It even says I influence my wife, who posts once every three months on Twitter. So, the bottom line is that by Klout standards, I almost have anti-influence. That is fine with me because I've never thought to chase influence anyway. But what that means for properties and companies and organizations like The Palms, as they brand their bellies with stars, is that they are very likely catering to the wrong people — people who have "influence" in the most illusionary way possible. You cannot cheat and hope to find influencers. Personally, I get bogged down by the whole influencer game. Sure, I write about it now and again and make it a point to share other articles that debunk it, like Ian Lurie, who continually shows that most algorithms cannot see what social media pros really need to see. But all in all, the influencer model is largely based on perception and faux popularity within a single environment. If you want to understand what kind of a mistake that might be, consider your local DMV. If someone with oodles of influence at an organization or within the community has to go to the DMV (without someone doing it for them), they will be waiting in line just like everybody else. Does this mean they don't have influence anymore? Or does it mean that influence has nothing to do with social networks and everything to do with anything those algorithms cannot measure? Or, perhaps, the better questions is: Are star-bellied sneetches the best? Whatever your answers, if I were the one in charge of The Palms social media program, I would flip the whole concept on its head. 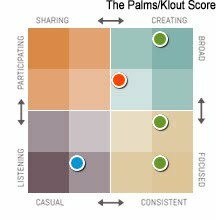 I would find people with real influence and invite them to join a "Palms" social media club instead of something based on Klout. Or, I would allow people with an interest in The Palms the opportunity to have the velvet rope lifted because they already plug it, day in and day out. You know ... I would reward customers instead of catering to numbers. But that's from someone who is apparently as anti-influential as they come, at least, according to Klout. Have a nice weekend.